Beyond the Bomb: A Grassroots Movement to Stop Nuclear War Nuclear Myths: What About Jobs? It would make sense to assume that because we spend billions of dollars on nukes each year, there are a lot of good jobs created. However, the billions fund only 42,000 jobs. And these jobs, by and large going to elites, frequently leave the local community in the dust. The closed doors of these labs, leave us very little to question: is this the best use of government dollars? Los Alamos is the birthplace to the nuclear weapon and home to one of the two nuclear labs in New Mexico. 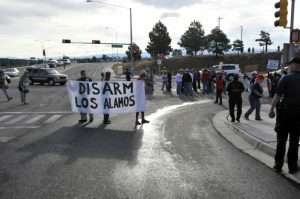 Los Alamos National Laboratories (LANL) employed around 9,650 people in 2010. Los Alamos also has the largest concentration of millionaires in the US, and yet outside of Los Alamos, New Mexico has the second highest poverty rates in the nation. Even as lab spending increases, quality of life in New Mexico decreases in tangible ways, such as health and education rankings. The $2.2 billion dollars a year invested into LANL has done precious little to benefit the community surrounding it. While the average salary in Los Alamos, inflated by the concentration of high paid scientists, is $106,000, the state average is a dismal $47,000. In fact, bordering counties, where many of the ‘civilian’ workforce can afford to live, report median incomes even lower; Taos and Rio Ariba both report averages under $40k. One reason for this could be because little of the spending by the labs is within the community; most of the labs industrial needs are purchased from specialized government vendors outside of New Mexico. And for the rest of the local population: One must also question why Los Alamos is made up of 73% white citizens, when New Mexico as a whole is made up of primarily Hispanic citizens (49%, with only 38% of citizens reporting as white.) LANL claims to employ a diverse workforce but real investigation into their own charts shows that 58% of their black, Hispanic or indigenous employees are in lower paying, non-management support roles. If you add the numbers up for LANL you can see a clearer picture – 75% of senior staff are white men, with people of color making up only 6% of upper management. Jobs created by nuclear weapons don’t seem to benefit the local community, but do they also harm the nuclear physicists working there? Federal law requires labs like Los Alamos to limit the radiation exposure of those working there, but allegations have been made that labs encouraged employees to put the badges that registered radiation exposure inside their clothing, where the measurements would be inaccurate. The Department of Labor has an Energy Employees Occupational Illness Compensation Program for “the men and women who sacrificed so much for our country’s national security” meant to address those who have suffered from radiation exposure.. The program has allocated 61,0000 employees, or their remaining family members, over $15 billion in compensation to attempt to treat the twenty-two recognized cancers that are a result of exposure. 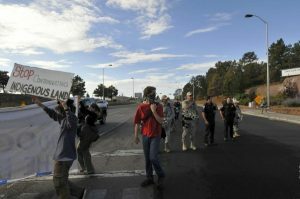 But only 53% of claims submitted from employees at Los Alamos have been approved. And today we see the number of claims has been drastically rising. The danger of labs has now added $15 billion more dollars to the price tag of nuclear weapons, in addition to the cost of human lives. The debate over the efficiency and benefit of nuclear weapon related job creation has been going on for decades. In 1991 experts argued that the cost of jobs created by nuclear weapons – $1 Billion for 24,000 jobs – was far less effective than civilian jobs, where that same billion dollars could have created 38,000 jobs. In 1998, when Dr. William Weida spoke on the hidden costs of our nuclear arsenal, he explained that the nuclear weapons program, the third largest spending program at that time, “kind of misses the economic point that the excessive spending devoted to nuclear weapons is a sunk cost that is lost forever. That means, that the American people were never given the opportunity to … decide whether they would prefer $100 million of extra spending for schools in 20 additional American cities or one B-2 bomber.” This holds true today, even twenty years later. In fact, twenty years later, we’re beginning to realize that these jobs have not been the economic boon we were promised. That means, that the American people were never given the opportunity to … decide whether they would prefer $100 million of extra spending for schools in 20 additional American cities or one B-2 bomber. At the end of the day, the argument that good jobs are created by the nuclear weapons industrial complex is a red herring. Sure, jobs are created, but at an incredibly high cost to everyone involved. The jobs created are for a select few, rarely local citizens, often create long term health issues, and do little to benefit the communities they take residence in. As Dr. Weida asked, would the money invested in creating these jobs not be better spent in other arenas? As our climate crumbles, the real work of investing in the infrastructure we need to survive is being overshadowed by maintaining a system of violence.